BOSTON, March 20, 2019 /PRNewswire/ -- Life is Good, the Boston-based positive lifestyle brand with a mission to spread the power of optimism, celebrates its 25th anniversary by shifting the national conversation from the negative towards all that's good. Coast to coast, the brand is making one simple, powerful appeal: "Tell us something good." For every #SomethingGood shared now through September 2019, $1 will be donated to the Life is Good Kids Foundation, which helps kids in need. The campaign aims to inspire 1 million shares and raise $1 million dollars. #SomethingGood is rooted in the childhood of Life is Good Co-founders and brothers, Bert and John Jacobs, who grew up in a chaotic household of six kids. There wasn't much money, and their dad struggled with depression. But that didn't stop their resilient mother, Joan, from instilling in them a profound, enduring sense of optimism. Every night, Joan would bring the family together around the dinner table and make one request: "Tell me something good." That simple prompt instantly changed the energy in the room and inspired everyone to focus on the good around them. "Our mom was the number one inspiration for Life is Good," says Co-founder Bert Jacobs. "She taught us all a valuable lesson: You decide what energy you bring to the table." 25 years later, that same energy is driving the #SomethingGood movement. A recent national survey conducted by Life is Good revealed that 74 percent of Americans experience anxiety on a weekly basis. This anxiety is largely attributed to people's constant connectivity to digital devices and the constant barrage of information that comes with them. From political scandals and mass shootings to racial and lifestyle biases, much of what is published is overwhelming, causing fear, uncertainty, anxiety, or depression. Despite this, 50 percent of the country remains optimistic about the future. And, 80 percent agree that an individual has the power to make a large-scale, positive impact. This optimistic outlook is what the #SomethingGood movement is after; to spread the power of optimism. Cultivating an optimistic outlook doesn't just change your perspective; it makes you feel better, too. Optimism has proven health benefits, like improved coping skills, reduced stress, stronger relationships, and (in more ways than one) a healthier heart. "We've always believed that optimism has the power to drive change," says John Jacobs, Co-founder of Life is Good. "For over 25 years, our community has shown us how sharing personal stories and messages can inspire others to focus on the good. #SomethingGood is a simple way to change the conversation to make a powerful and lasting impact." World champion gymnast and Life is Good ambassador, Aly Raisman, continues her proud support as a member of the brand's Good Vibe Tribe. She has a limited-edition signature collection of Life is Good T-shirts – including the Aly Tee – which celebrates courage, authenticity, kindness, and optimism. "Life is Good is all about spreading the power of optimism and focusing on the good," said Raisman. "I am thrilled to continue sharing the message of positivity and join the #SomethingGood movement. I truly believe that a seemingly small act of sharing something good can shift perceptions and have a positive impact on the greater community." Along with Raisman, Dunkin', a brand that is known for refilling optimism with each cup, will be helping to fuel Life is Good on its way to 1 million shares by acting as a launch partner for the campaign. 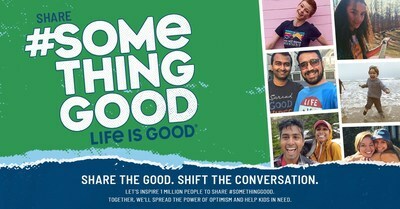 Also on board are Life is Good brand partners Schwinn, Samsonite, and more who will share the #SomethingGood message. Join the movement and share #SomethingGood. Visit the Life is Good website at Lifeisgood.com/somethinggood to learn more. The Life is Good Company is a $100 million lifestyle brand dedicated to spreading the power of optimism. The company donates 10 percent of its net profits to help kids in need through the Life is Good Kids Foundation. To date, the foundation has positively impacted over 1 million kids every year, many of whom are facing early childhood trauma. Life is Good® is a registered trademark of The Life is Good Company. Please visit LifeisGood.com for more details, and follow Life is Good on Twitter, Facebook and Instagram.